Anyone looking for evidence that our beloved animals in spirit will be waiting for us at the "Rainbow Bridge" when we die would have found it last night during Psychic Medium Joanne Gerber's appearance at the Hampton Inn in Natick, MA. The three-hour "Holidays Past" event drew an appreciative crowd of about 100, each of whom (including me) had come in hopes of hearing a message from a departed loved one. Though I was not one of the lucky people who received messages from people they knew, I was far from disappointed. 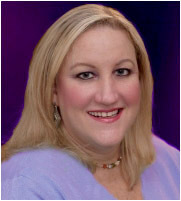 Joanne Gerber is a well-respected Medium, with proficiency certifications from the Windbridge Institute and from the beneficiary of the event, the Forever Family Foundation, which "furthers the understanding of afterlife science through research and education." Not only was Joanne generous, compassionate, and grounded, but she was also astonishingly accurate in providing verifiable details about the spirits who were using her energy to communicate with people in the room. What impressed me, in particular, were the dogs and cats who came through. There was a bulldog with a spiked collar, "Spike," who Joanne saw while describing the husband of one of the audience members; he had died 17 years ago. An elderly woman appeared with her cherished cat. An older man was there with his large, German Shepherd-like dog. Joanne knew nothing of these people or their pets until they had beckoned her from the spirit world. What she conveyed was that they and their animal partners had somehow found one another in an unearthly dimension and were still reveling in the joy of their mutual companionship, as if nothing whatsoever had changed. I was especially moved when Joanne asked if anyone had lost a young golden retriever named "Jack" or "Jake." A young woman raised her hand and said that yes, that might be her dog: her golden retriever, "Jykes" (or a similar-sounding name), had died not too long ago. This dog came through on his own, with no human spirit to accompany him. When Joanne explained that she heard the dog apologizing for having run away, the woman burst into tears. Joanne said she saw Jykyes being hit by an 18-wheeler truck. Sadly, that was exactly what had caused the poor dog's demise. But lest the dog's former caretaker melt into grief, Joanne was quick to soothe her, sharing a current vision of Jykes gallivanting happily in the afterlife, without a care in the world.